Here’s a riddle: What costs $600,000 the pair, takes 18 month months to build, weighs 1000 pounds per side, must be driven by ten amps, employs an active DSP-controlled crossover, uses six ALE compression drivers and four custom-made midbass and bass drivers, has trapezoidal and spherical horns CNC-milled out of aircraft-grade aluminum, and sounded downright awful at Munich High End a couple of months ago? If you read my show report, you already know the answer: In my opinion Magico’s ultra-expensive, ultra-exotic, five-way, horn-loaded Ultimate III was a disappointment in Deutschland. In California, the U3s were ensconced in a virtually ideal listening space. Purpose-built by Alon Wolf at a cost of over $250,000, the Magico listening room in Hayward, CA, is a floating chamber built from an outer shell of 5" Quiet Rock with an inner shell thirty-three-feet long, twenty-two-feet wide, and thirteen-feet tall constructed on resilient channels of 2" sheet rock (which act as a membrane trapping the bass down to 25Hz). The inner room is also treated on its interior with a variety of RPG’s wooden acoustical diffusor panels. The Magico listening room has a noise floor of 24dBC SPL! Short of an anechoic chamber it is the quietest place I’ve ever listened in. Second, a horn plays louder, with greater speed and dynamic range, because it more efficiently couples its driver to the air of the room via a phenomenon known as “acoustic impedance-matching.” Like a megaphone, a horn constricts the area and volume of air that the driver (or human voice, in the case of a megaphone) works “into.” As a result of this constriction, the acoustic impedance of the air trapped in the horn’s throat (the narrowest part of the horn immediately in front of the driver) comes much closer to the high acoustic impedance of the driver’s diaphragm. (When the impedance—the electrical, mechanical, magnetic, or thermal opposition of a system to the flow of energy—of a source and a load are matched, power is transferred maximally.) This superior impedance-matching of air and driver allows a horn to generate higher pressures from smaller movements of its diaphragm. Moreover, as the horn’s tapered shape gradually increases in area toward its mouth (the widest part of the horn that opens onto the listening room), those high-pressure soundwaves generated in the horn’s throat by miniscule vibrations of the driver’s diaphragm grow lower in pressure and progressively larger in displacement as they travel down the horn’s length, allowing them to couple more efficiently to the low-impedance air of the listening room. A horn-loaded driver is in many ways the ideal acoustical-energy delivery system, typically providing ten times more sound power than a cone speaker would from the same amplifier output. But playing much louder with much less amplifier power is only one of a horn loudspeaker’s inherent virtues. Because the diaphragm of the driver attached to the horn works so much more efficiently (thanks to increased directionality and acoustic impedance-matching), the driver itself has far less work to do than a non-horn-loaded driver, such as a typical direct-radiating cone or membrane that has to move air without the benefit of impedance-matching. The horn-loaded driver’s much smaller excursions mean much lower inertia and distortion (and no backwave to speak of), which translate into a clarity, electrifying speed and pace, and sensational dynamic range that have to be heard to be fully appreciated. No other kind of loudspeaker can move air as efficiently as a horn speaker does—and on powerful instruments or large ensembles the effect can be startlingly realistic. Because of horn-loading, the very high-pressure soundwaves generated in the horn’s throat are literally reflected off the throat walls. Any irregularities in those walls (any bumps or dips or material or structural resonances) and any high-Q resonances in the drivers themselves (when a compression driver is run out-of-passband, it decouples from the horn, particularly in its lower frequencies, generating distortion) will add a characteristic turbulence to the signal that ends up being amplified along with the music. The sonic result of this added distortion is the “cupped hands” or “horn coloration” that you typically hear on P.A. systems—like someone talking with his hands so tightly cupped around his mouth that they slightly pinch his nose. Such colorations also have the psychoacoustic side effect of localizing the drivers, making them sound even more like individual tubes than like a coherent loudspeaker system. Additionally, though properly designed horns are inherently phase-correct transducers, the various resonances of the materials the horns are made of and the necessarily (because of the physical size of the tubes) much wider disposition of the drivers in space vis-à-vis each other can make overall time/phase/frequency coherence a dicey proposition. The small cone and dome drivers of a latter-day dynamic loudspeaker are typically located to the exact micrometer on a baffle—to ensure a time/phase/frequency-coherent wavelaunch. Though the positioning of drivers in a horn system is also mathematically precise, the horns’ physical size, their inherent resonances, and, paradoxically, their more highly directional wavelaunch tend to work against such coherence at normal seating distances, once again making you increasingly aware that you’re listening to separate drivers playing in separate frequency ranges. 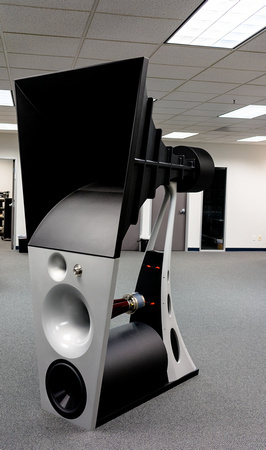 However, something marvelous has happened to horn loudspeakers in the last few years: DSP. 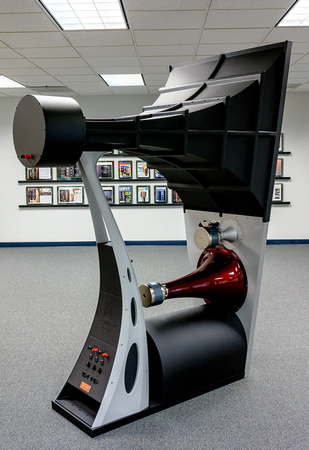 Although you might think (correctly) that I’m the last guy on earth who would celebrate anything digital, I have to admit that horn loudspeakers, such as the Magico Ultimate III and Avantgarde Zero-1, make far and away the best case I’ve ever heard for DSP. There is simply no analog way to completely correct a horn’s built-in amplitude, phase, and impulse nonlinearities (or to blend horns with a dynamic woofer). But there is a digital way to do all these things. Computerized crossovers can generate slopes of such complexity and sophistication that—given the proper programming—drivers that don’t typically cohere seamlessly and colorlessly can be made to cohere seamlessly and colorlessly. When DSP is implemented in a no-holds-barred, five-way horn system like the U3, where structural resonances have also been eliminated and drivers are never asked to work outside their passbands, the results are thrilling. Here is what the Ultimate III can do that no other horns I've heard (save for the Avantgarde Zero-1, which is also DSP’d) can: largely disappear as a sound source. The blend of drivers is so seamless, the soundstage so wide and deep, the top-to-bottom tonal balance so neutral, the imaging so natural, the transparency and resolution so very high that the U3 sounds more like a Quad 57 than a typical horn system, until, of course, changes in intensity come along and then you get what no other kind of speaker can give you quite as realistically—the dynamic range of the real thing. As terrific as the far-more-affordable Zero-1 is (see my forthcoming review in Issue 245, from which some of the previous discussion of the virtues and shortcomings of horns has been adapted), it cannot compete with the U3 in sheer lifelike presence—nor should it be able to considering the staggering difference in do-re-mi. Magico’s use of ultra-expensive ALE compression drivers, horns CNC-milled to buttery smoothness from thick aluminum stock, an extraordinary 15" dynamic woofer of Magico’s own design, and a separate midbass horn that permits crossing over to that woof at 120Hz simply set it apart from virtually all other horns in build and performance. The sonic result of all this effort and expense is, as I noted earlier, a speaker capable of reproducing pitches, timbres, durations, and dynamics with a clarity and precision that make every other speaker I’ve auditioned—including some truly great ones—sound slightly “smeared” in comparison. Here, for once, all of the things that in theory make horn loudspeakers superior transducers—the directionality of their wavelauch, their near-distortionless drivers, their almost ideal transfer of acoustic energy from source to room—work in concert to near perfection, and do so from top to bottom on music large-scale and small. To hear the way this speaker conjures a piano, a sax, a trumpet, a drumkit, a standup bass, a string trio, a large chorus, or a full orchestra—and the incredible resolution of performance details it wrings from all these instruments and musicians—is to come a step closer to feeling that you're in the presence of actual instruments and actual instrumentalists. So why is it that am I not quite prepared (yet) to call the U3 “the best speaker in the world” (although, God knows, it is certainly very, very high among the best)? Well, for several picayune reasons that may actually add up to one long-standing bias in favor of analog sources. First, as great as the blend is between the U3’s four horn-loaded drivers and its superb dynamic woofer (and it is the best blend by far of any horn/cone-woofer system I’ve heard—in fact of any hybrid of any type), that woofer doesn’t have quite the bottom-octave expansiveness that some other great dynamic loudspeakers have. Oh, it goes down deep—35 to 40Hz—with simply incredible resolution, power, speed, and control, but it doesn’t have all the lifelike bloom and warmth in the bottom-most octaves of certain large dynamic speakers. There is also a very slight reduction in bloom in the topmost treble. While the U3 is unrivaled on stick work—even extremely delicate brushes on cymbals are reproduced with a clarity and presence that I’ve never heard before from any transducer—the sense of the note expanding into free space, lighting up the air around it, and setting it into wave-like motion is just the slightest bit curtailed. Part of the issue here—if you want to call it an “issue”—isn’t so much inherent in the speakers but in the source. In Cali, I was only able to listen to the U3s with digital files (albeit great ones), and because the speaker is so damn transparent, digital recordings sounded, well, more digital. (Thus, in part, the reduction in bloom at the extremes and the inertness of the air between and among instruments.) At some point I hope to hear the U3s with a great analog source component, like a UHA Phase 11S OPS reel-to-reel tape player or a world-class phonograph like a Walker V or TW Acustic Black Knight. (Of course, any analog source would have to be digitized to be played on the U3.) For the nonce I’m more than comfortable saying that if you’re extremely rich (and extremely crazy) and live in a house with a great listening room of ample size and own exceedingly high-resolution/low-noise electronics, you owe it to yourself to audition the Ultimate III. Properly housed and driven, it very likely is the best transducer for file-based digital playback. And though analog playback remains a bit of an unanswered question as of this writing, I find it hard to imagine that the U3s will prove less than breathtaking on any source.They were certainly more goosebump-raisingly realistic on Elinor Frey’s cello, the Janacki String Trio’s violin, viola, and cello, Gregory Porter’s voice (and the ambience of the studio he was recorded in), Keith Jarrett’s piano and Charlie Haden’s doublebass, and the entire Minnesota Orchestra than any other speaker system I’ve heard. This is spooky realism you have to experience for yourself (if you’ve got the bucks and the opportunity). Just be aware, if you do have the money, that once you hear the Magico Ultimate IIIs you may find it tough to settle for anything else.